crafting with katie: MCT Beary Special Blog Hop! Even though it's not quite Halloween, Emma has decided to give you all a "Beary Special Treat"! This doesn't cause weight gain, but it will cause CUTENESS OVERLOAD! Included in this hop, you will see a "Beary Special" stamp set that was designed by Emma for this special hop! Also joining us for this hop are 5 VERY TALENTED "Guest Designers"! So, you should have arrived here from Jeanne's blog, but if you happened upon here by chance, you'll want to head over to Emma's blog to take this from the beginning! I used the new Cricut Teddy Bear Parade cartridge for my card today. 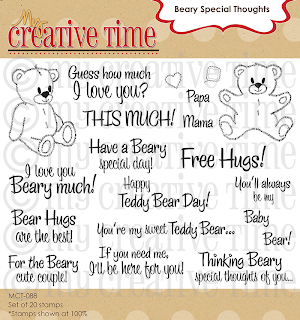 It's perfect paired with Emma's new Beary Special Thoughts stamp set! My card base is cut at 5" from the Cricut Birthday Bash cartridge. I cut the coordinating square layer, along with another square 1/4" larger and sewed them together. The cute bear is cut at 3 3/4". I cut the face mask twice, so that I could put a patterned paper on top of the solid colored straps. I also used a Peachy Keen stamp for the eyes instead of the ones that come with the cartridge. The top right corner of my card looked a little bare, so I cut some more of the heart layers, at 6". Emma has a few GREAT giveaways to give to 3 LUCKY peeps! How FUN is this??? All you have to do is leave your comments on the designer's blogs. The more blogs you comment on, the BETTER your chances are at winning! Random.org will pick the winners on Tuesday! So you have until Sunday, September 30th at midnight to get all of your comments in! PLEASE don't forget to include a way for us to contact you just in case YOU are one of the lucky winders! Good luck! Your next stop is my sweet and talented friend Kim! Your bear is adorable and the card just so cute! Love this shape of the card too! LOL.....This is TOO CUTE!! !Super Cute!! CUTE! I love that postage style card. So cute! Such a cute card. I hope your friend had good news from the biopsy. I know this card cheered her up! This card is so cute, I love it! I hope all goes well with friend. This card is just so sweet, I know your friend will love it. You are a great friend. I hope all goes well and thanks for sharing the cute card you made. Your friend is going to love the card. The sentiment is perfect. Oh my goodness, this is so cute! Love his scrubs. Hee hee. Love your card! And I've had my eye on the "Teddy Bear Parade" cartridge, so I'm heading to the start of this hop right now! TFS! LOVE this! So adorable! Love the colors too! Perfect card for your friend! What a cute card!! This release is amazing, you are all so talented. I can bearly stand how adorable this card is!!! To cute for words... Love all the little details. super sweet and I am sure your friend appreciated it!! Cute card. I am sure this is just what your friend needed. Hi Katie! What a cute card. 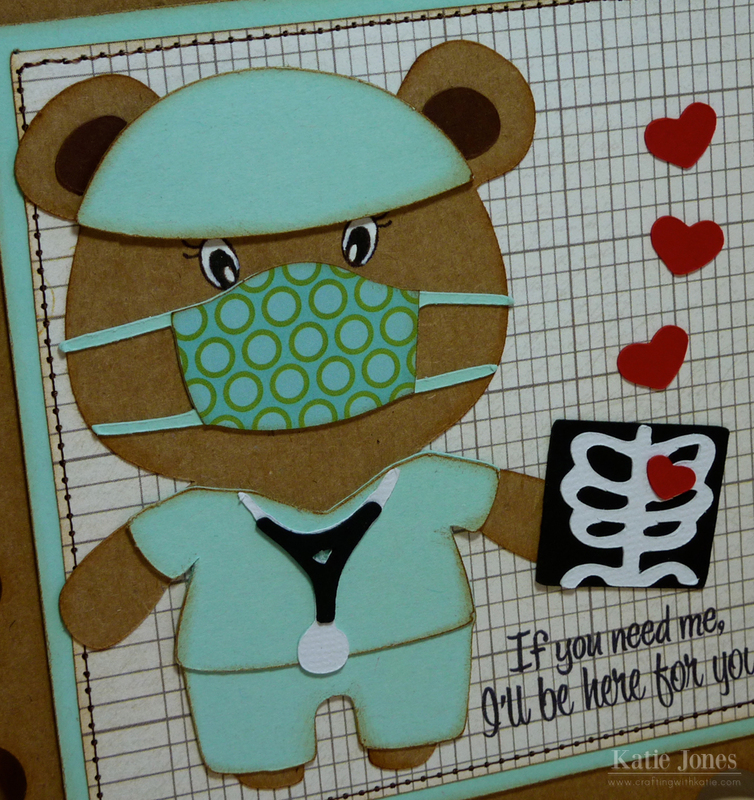 Love all of the details such as the stitching and extra hearts and what a cute surgeon bear. Thanks for sharing. I love this card. It is very cute. How cute this bear turned out. Perfect stamp choice too. Oh my Gosh!!! How cute is that Bear!!! How cute is this hop!!!! How cute is this Set!!!! I love this card. Someone in my life is soon to have surgery, so this idea would be something perfect to send before she has surgery. Thanks for this idea. I gotta have these stamps. Thanks for sharing. Your card is adorable Katie.Love the little bear in scrubs,just perfect with that sentiment! Oh soo cute LOVE it!! Ahhhh I love this! And I am so going to have to make one like this (I'm a hygienist so I could use this A LOT)!! so cute love the lil dr bear tfs! SOOO incredibly CUTE!!! What a perfect sentiment for that cut!!! That is really cute - hope your friend is okay. Wow. great card. What a cute idea to put a smile on someone's face. OMGosh this bear card is too cute!! 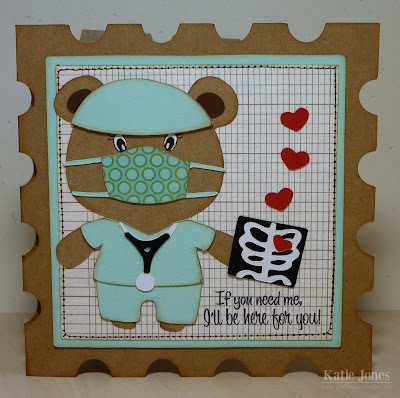 I love this little doctor bear and the sentiment works so perfect!! This cute card will put a smile on your friends face for sure :D What a fun release and cartridge...Great job! Being a nurse I just loved this bear! Very cute! Katie, I love your card. This card would make anyone feel better just seeing it. Thanks for sharing it. Very nice! Great card for a doctor. Cute card, love how you have him dressed as a doctor. awwww.....this card is so adorable!! Oh my goodness. What a precious card. Thanks for sharing. Your card is super cute!! Just proves how this stamp set can be used in so many ways!! This bear card is the cutest ever! Love his scrubs and the colors are great! I love the Dr. Bear he is so super cute! The little x-ray is super cute also with the little hearts coming up from it. What a cute cartridge that is. Add to my want list. Super cute card. Perfect for anyone having surgery or recovering from an injury. Thanks for sharing. Oh man, that card is so darn cute. I just have to have that cartridge. 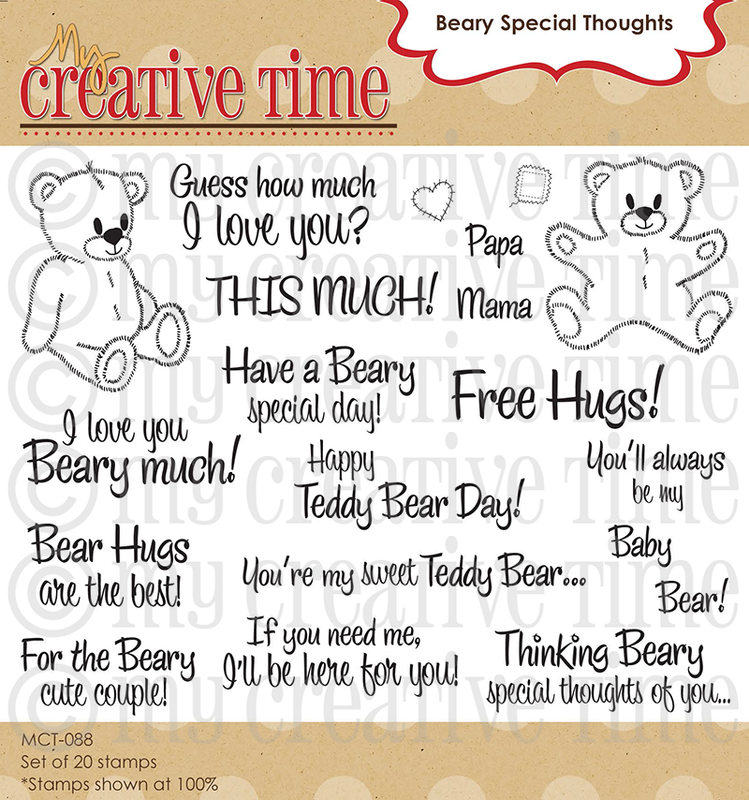 What an adorable card, I just love the new Teddy Bear Parade cartridge, it's so perfect for this new stamp release! The recipient will totally love this card, it's just precious! Too cute. I'm loving this teddy bear cartridge and the stamps look amazing too. Cute card, the sentiment is perfect. Oh Katie you out did yourself on this one! All the extra cuts and layering. It all adds that special touch! This little card had to cheer up your special friend and put a smile on their face. I know mine is glowing with exitement with all the inspiration that's being shared today on this hop! What an adorable card! LOVE the mask....so cute. This is super adorable!!!! Thanks for sharing!! This card is so super adorable! LOVE the sweet bear and the great sentiment!! Very cute! The perfect card to brighten someone's day! This is just to darn cute! I love this card. Thanks for sharing. so cute! Love this hop. This is one of my favorite projects on this hop! TFS! What an adorable card. I love the medical bear and x-ray. So sweet! I love your teddy!! So adorable! I love the patterned mask and postage stamp shaped card! I hope all goes well for your friend! Your card made me laugh, that would be a great get well card or a I'm there for you card. I love it really creative. Thanks for your ideas. lol!! I LOVE it!! That little Dr is the cutest!! Great job as always! Perfect card for your friend. I like the hearts coming from the xray. Great card. Love that cartridge. Katie,this card is so perfect to have given to your friend! I think it is so adorable! GREAT card.....LOVE IT!!!!! TFS with us! just love this card sooooo cute! Too BEARY cute!!! The person getting this card is sure to love it. Your card is so cute. Great job! 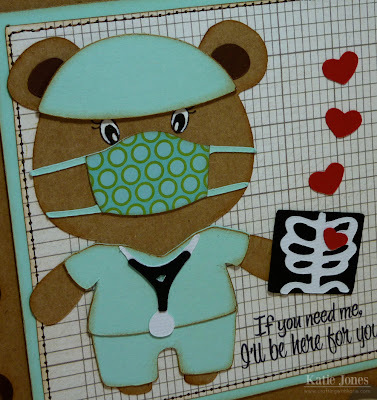 Very cute card, love the Dr. Bear and the X-ray. Best wishes for your friend, I hope everything turns out alright for her. Adorable love the little bear dressed as a dr.. too cute. I'm a surgery nurse so this card really makes me feel at home. great job. Cute doctor bear.Hope your friend doing well.Thabk's for sharing and chance to win. Funny card for a good friend. the doctor bear is so cute! Love the card. I am enjoying your other work too. Cute card to give someone that is under the weather. I cannot resist...more of Emma's incredible stamps to add to my (ever-growing!) wish list!!!!!!! Thank you for sharing...have a wonderful day! What an adorable card, the more projects I see created with the teddy bear parade cartridge, the more I want it. This has to be one of my favorites! I love this dr bear card. Now I'm falling for the critter cartridge, so cute to dress up the bear so many different ways. ha ha ha! that's awesome! love it! Wow that card is awesome the bear is just perfect for the sentiment, thanks for sharing. Awwww, such a cute bear and card! Perfect lovable surgeon teddy!! Love your card! How cute is that little doctor bear!! OMG!! Love your card and this stamp set is just perfect for it! LOVE!!! How cute is he!!! I work in a doctors office and the nurses would love it!!! Omg this is so cute. My hubby is currently going through cancer treatment and just had surgery. This card would be perfect for him! TFS. soo adorable, love the bear and sweet setiment!!! Getting so much inspiration. Thanks for the chance to win. debstarrc at gmail dot com. this card is so so so cute!!! I love it!! Very cute!!! Love the teddy bear! What a cute card! Love the new stamp set. Tfs! Teddy Bears are the Best!!! Hope I win one of these great przes. So SO cute! I need a card just like that to send to a friend. What a terrific idea! Thanks for sharing. Love love love your adorable card! My husband's doctor is helping us get his hospital bill covered by our insurance and this will be the perfect card to make for a thank you when all is done. TFS. I absolutely love this card and the sentiment stamps are adorable! Thanks for sharing! LOVE the little x-ray! I am really enjoying seeing everyone's take on the stamp set and cartridge! Katie you always make a wonderful job on your project. Amazing card. The card shaped is fantastic. Thanks for share. 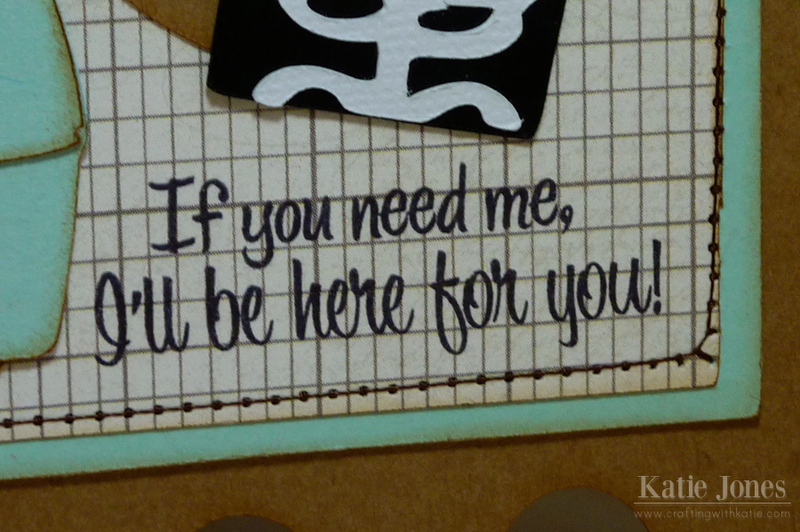 Katie, this card is perfect, I am pretty sure your friend knows she can count on you, what a sweet way to say it! love this card especially the mask!! have to wear one at work everyday and love seeing this!! Sweet surgeon bear!!! I love the colors and papers you used and the stitching around the edge! Thanks so much for sharing! katie, how cut is he! I love that aqua with the kraft too! What a great friend. She will love it. 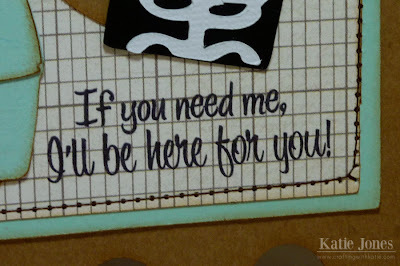 I just came over from Jeanne’s blog hop; I got to say I love your doctor bear it would make any one feel better. Wow Katie! This little doctor bear is so adorable! I love the little peachy eyes and the mask! :) And the sentiment is perfect!! Katie, you have a kind heart! Im sure you friend appreciates your thoughtfulness! The card is adorable and Im sure your friend loved it! Great job!